The submitted widget will be displayed with the tag [earth]. A personal favorite access analysis widget. 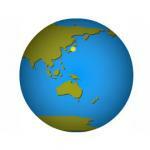 Customize a globe that shows the location of users accessing your blog or website. Customize the layout, color, and text that appears.